I made a lot of homemade pizza before I was vegan, and this is actually the best one I’ve ever made, cheese or not. 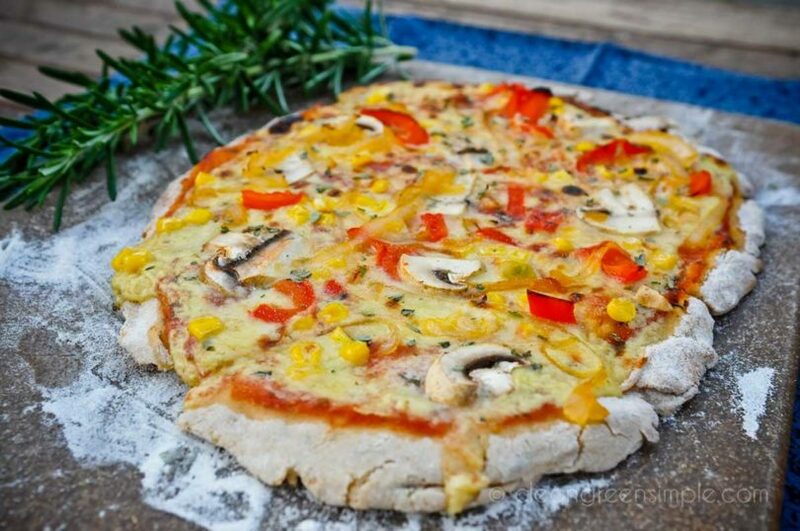 Try this incredibly good gluten-free, vegan pizza tonight! Now, Andrew enjoys my cooking and compliments me on it regularly, but it really takes something special to earn profanity. And this pizza was something special. It’s a good thing I have a blog I like to make new recipes for, because if I didn’t I’d probably be eating this pizza every night for the next week or two. 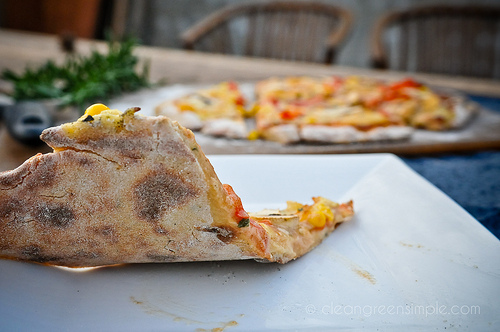 Vegan pizza is one of those elusive goals – it’s so hard to get it just right. With the commercial fake cheeses you can get close, but personally I notice a slightly off taste, and I don’t really like to eat fake cheese. With other replacements (no cheese, mashed beans, etc.) there’s a nice pizza-esque quality but you’re not fooling anyone into thinking they are eating real pizza. I’m not saying this is the perfect pizza either, but in my opinion it’s the closest I’ve had. I made a lot of homemade pizza before I was vegan, and this is actually the best one I’ve ever made, cheese or not. It’s even gluten free, so that old argument kids like to make about pizza being health food (“It’s got all the food groups, mom!”) is getting closer to being reality. That’s actually enough dough for one large or two small pizzas – it looks small because that’s a huge bowl. You are under no obligation to use a huge bowl, I simply chose it for the same reason I make most of my dish-based decisions: everything else was dirty. Now cover that bowl with a dishtowel and set it aside. You can put it somewhere warm, like near the oven, but I just left mine on the counter and it was fine. 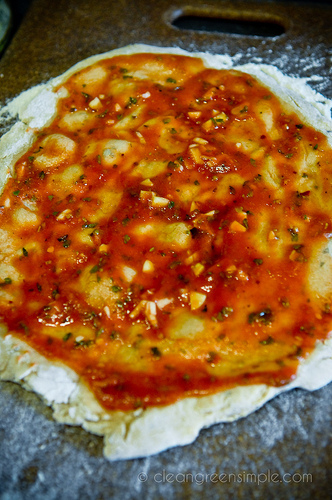 Now you can make your pizza sauce, which is also super easy. 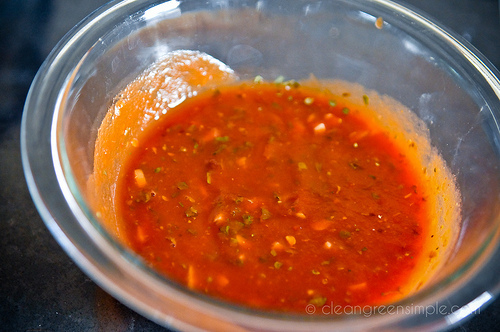 Just mix together some crushed tomatoes, herbs, and minced garlic. You don’t even need to heat it. While that heats you get to bake your dough. I always prefer to make individual sized pizzas, because they are easier to work with and everyone can customize their toppings. So in this case I split my dough in half and rolled one half out on a floured cutting board. And I mean well floured – like a handful at least. Don’t skimp here, it’ll make your whole experience much easier if you use enough flour that the dough can still easily slide around the cutting board. Now here’s my fun homemade pizza trick: cook it under the broiler on a cast iron skillet. Just take a 12″ cast iron skillet and flip it upside down and stick it under your broiler. Let it heat up in there for at least 10-15 minutes (I just let it heat up while I make the dough and stuff). 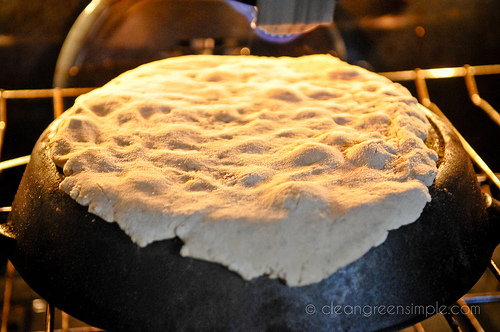 Once your dough is rolled out, just slide it onto the preheated upside down skillet and let it cook for a minute or two. 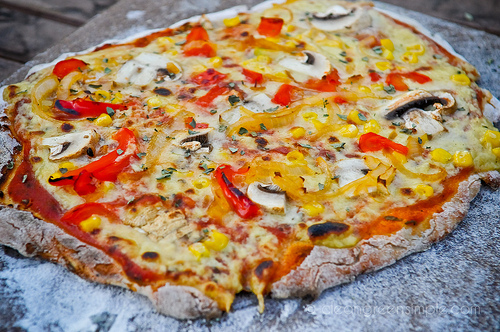 Literally – this method cooks your pizza very quickly so keep an eye on it. There’s a whole science to cooking pizza dough that I haven’t thoroughly studied, but I know this technique works better than any other I’ve tried and a cast iron skillet is cheaper and more multi-purpose than a pizza stone, so I go with it. Then pour on your “cheese” – it may seem a little liquidy but it will thicken up when you bake it. I used a gravy boat to pour it on in an even layer, but you could use any spouted cup or even just spoon it on from the pan. Then add your toppings. I went with grilled onions, red bell pepper, sliced mushrooms and frozen corn, but of course you can use whatever you want – if you don’t know what you like on your pizza by now I don’t think I can help you! Then slide that back onto your skillet and bake it for maybe 3 minutes or so, until the cheese is just starting to brown. 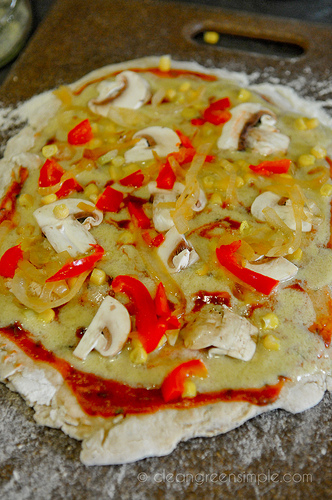 Repeat the process with the other half of the dough and toppings and you’re all set! Since the pizza cooks so fast, you can really get 2-4 cooked before the first one is too cold. I went with a sort of sloppy shape but there’s no reason you can’t make a nice clean little circle and cut it like a regular pizza, the dough is easy to work with. This recipe makes enough for two 8-12" pizzas or one 14" pizza. I include instructions for a mixed veggie topping below, but you can of course use whatever toppings you'd like. This looks like a complicated recipe but it really is pretty easy, especially once you get used to it. Before you prep your ingredients, put your skillet (or pizza stone or whatever) under the broiler and start preheating it at the highest temperature it will go. 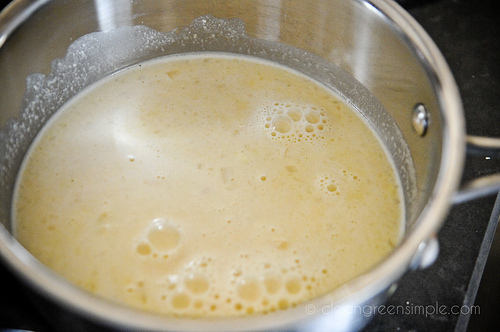 In a small bowl, dissolve yeast in warm water until white and creamy. In a large bowl combine flours, flaxseed, salt, oregano, basil, and red pepper flakes. Make a well in the middle and add yeast mixture, agave nectar, and apple cider vinegar. Stir well to combine. Cover and set aside while you prepare the sauce and cheese. Place all ingredients in a blender and process until completely smooth. Transfer to a small saucepan. Cook over medium-high heat, stirring almost constantly with a whisk until thick and smooth. If you start heating the veggies, then make the dough, then make the sauce and cheese, it should all come together pretty smoothly. Once you’ve got your cheese mixed (but before you heat it) you can roll out and pre-bake the dough for about 60-90 seconds. (Note – in addition to flouring the cutting board really well, use the widest spatula you have to slide the pizza gently onto the skillet. This will help ensure that it doesn’t tear or fall off.) Then heat your cheese until it thickens. 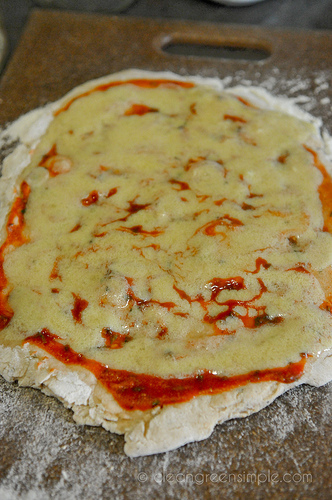 You can then assemble the pizzas – sauce, cheese, toppings. Slide the assembled pizza back onto the heated skillet and bake for an additional 3-4 minutes until the cheese just starts to brown. Remove from the oven and let cool while you cook the second pizza. Let cool, slice, and serve. Wow, that pizza looks so delicious! I have to try it asap! That looks amazing and I love your technique for baking the crust! Ohhh that pizza! Honestly I have had so many pizza dough fails my boyfriend asks me to bake it at 600 degrees if he hears I’m attempting pizza for dinner. Your method makes the dough look wonderful! Your pictures are great! I love that you made a vegan and gluten-free pizza that actually looks delicious. Tried this pizza on the weekend. I can’t have tomatoes so I just used a little olive oil and garlic for the base and then the cheese sauce and toppings. It was delicious! I frozen a bunch of it for lunches for me. The dough tore a little bit in the process but I think I might add a little olive oil to the dough next time. Thanks for the great recipe and making me feel like I can eat real food and enjoy it despite all my food limitations! I’m glad you liked it! I use a big wide spatula with rounded corners to help prevent the dough from tearing when I transfer it, that helps a bit. Looks absolutely amazing — I must try this! This looks amazing! I must try it! I just made this pizza tonight for my house of 14 vegetarians (I had the multiply the recipe by 6 to make enough for everyone). I made it with regular flour though as we don’t have gluten-free flour. It was great! The vegans were very happy and the dairy-eaters were very impressed by the fake cheese. It took me over 3 hrs to make 6 batches, by myself, with just one oven, but I think it was worth it. My housemates are full and happy! That pizza looks amazing! And I love that sauce from the Uncheese cookbook, I haven’t made it in a long time. Is there another flour that you’d recommend using instead of amaranth? I’m not a big fan of amaranth and don’t have any in my stock. Your pizza and the baking technique looks awesome! Hi! I am making the pizza now, but can’t seem to find the oven temperature. I put it on 400 as thats my best guess. Thanks! I made this last night for my family (My husband and 3 boys aged 11, 10, and 8) and everyone loved it! I have been looking for a good “cheese” recipe for pizza and this was amazing! We have been vegan about 3 months and the boys have struggled the most with giving up the old way of eating. This helped in leaps and bounds for them! My 10 year old said it was the best pizza he had ever had 😀 Score 1 for vegan moms everywhere! The only thing I changed was the flour (we only had whole wheat on hand) and I used 4tblsp of flour instead of corn starch in the sauce as we were out. It still turned out thick and delicious! 🙂 Thanks soooo much! Not sure where I went wrong…however the crust was extremely hard to mold. It seemed to remain liquidy…maybe I didn’t let sit long enough? We don’t have a cast iron skillet so we were going to use a cookie sheet. We tried and it seemed to be too think and didn’t cook thoroughly. Any suggestions!?!?! I ended up eating my son’s pizza that was “traditional” crust. Hmm. You could add more flour to the crust, or chill it in the fridge…it should definitely not be liquidy. Maybe you added too much water? Not sure what to say other than maybe try it again sometime, I think it works for most people. Sorry! What awesome pizza! Thanks for the great recipe! This pizza is super yummy. Thanks! Wow, this looks amazing! I’ll be making the “cheese” sauce tonight for the first time. I don’t know if there will be any leftover, but if so, can it be stored in the refrigerator? For how long? Very excited about trying this!! Thank you for the recipe! Honestly I don’t think it keeps very well – it kind of hardens as it cools. Best to make it fresh each time if possible! Thanks so much for getting back to me. I did put it in the refrigerator but I think I’ll just toss it. The problem is that my husband is vegetarian and eats cheese so I make two pizzas — one with real mozzarella and another with a “faux” cheese. I end up with so much leftover. I’ll just adjust the amounts and that should make a huge difference. Thanks again! YUMMY. Looks like a lot of work but worth it! Can you use guar gum instead of arrowroot? I just bought a bag from whole foods and not sure if it would taste funky in the cheese. I don’t think guar gum would serve the same purpose – cornstarch or potato starch would probably work better as substitutes in this instance. Thank you! I’ll be sure to try it some day! Wow, this looks great. 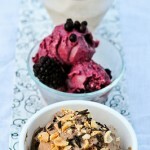 I’d love to make it for my family but my son can’t have tahini (allergic to sesame). Is there anything I could replace that with? Hello! A friend of mine showed me your pizza recipe and I tried it last night. It was really good. I’m going to blog about my experience. Thanks for sharing! Please check out my blog site and read about me and my ‘ME-gan Lifestyle.’ I am gluten free, dairy,egg, and meat free – so this recipe was fun to try out! Thanks for sharing! I’m really interested in trying the cheese sauce! I’ve tried other recipes but they are too complicated! Would you recommend this cheese sauce for enchiladas..? I just made this pizza and it turned out amazing!!! Thanks for posting the recipe. I’m going to try it out with different topping combinations for fun, although this one was delicious!! I’ll be searching here for more vegan gluten free recipes. Thanks!! could you use just rice flour? After you make the Crust, can you freeze it for later use? 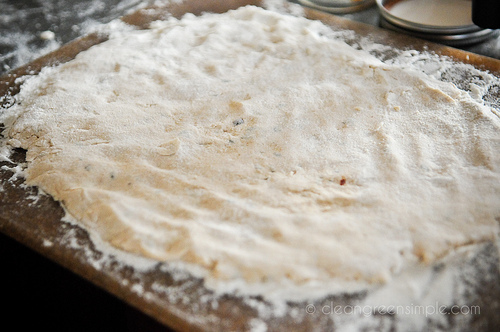 My daughter has food allergies, which is why we are interested in this pizza recipe. She can’t have the sesame tahini called for in the cheese sauce recipe. Is there something I could use to replace it? She can have all natural peanut butter, but would that alter the flavor? What do you suggest? Thanks! Made this pizza tonight & it was great. Next time I’ll make the crust a little thinner cuz I like it crispy. So yummy! I only made one pizza…does the dough freeze well? I believe it does, but haven’t tried it yet – let me know if you do! I just made this tonight and it was AMAZING! My 16-month old daughter, who is dairy and gluten intolerant, LOVED it and couldn’t get enough. 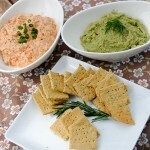 My husband even said it was “pretty good.” I was like, “can I quote you on that?” I love the vegan cheese recipe too and will use it often now. Thanks so much!! This looks very good! Excellent work and vibrant presentation. Made the crust with a green pea flour and coconut flour instead of amaranth. Had to add more liquid than the recipe called for to form a dough. It was green but delicious! Topped with roasted pepper sauce, sauteed spinach and mushrooms. Didn’t bother with the “cheese sauce”, maybe another time… Thanks for the recipe, doll! How’s the amaranth in this? I’ve cooked it before and didn’t care for it. Would a buckwheat substitution work? PS- made your banana bourbon pie- it was good! (And easy) The family is already demanding another. Great idea! I don’t think you can taste it particularly, but I’m not that sensitive to the flavor of amaranth. I think buckwheat would work fine. Glad you liked the pie! So good!! My husband and I ate the whole pie. Any idea how many calories per serving? Am I the only one who can’t seem to find an oven temperature?! I’m guess 425 will suffice but I’d like to know what the recipe calls for! There’s no temperature because I put it under the broiler which on many ovens is just “broil” – on some it lets you set the temperature of the broiler, in which case go as high as you can! Mine is 550 degrees. It needs some sort of sugar to feed the yeast, but you could probably use some other kind of sugar if you have one you prefer. This recipe turned out really good. My family loved it. I didn’t have red pepper flakes, so substituted cayenne pepper. My husband said he loved that! 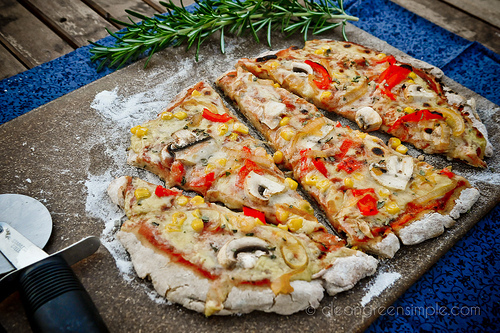 i made the pizza (and it tastes great) however the crust was a bit crumbly when i went to roll it out so i added a bit of warm water – is this the best solution? also – how thick should the crust be when rolled out? I dont have a broiler – will a regular small oven do? it can go up to 275 degrees celsius. Do you think that this crust would be freezable? I think so, but I haven’t tried it yet. I made this pizza for a party where 2 of the guests have celiac disease, and one of the guests is lactose intolerant and can’t even eat cheese. It turned out great and everyone wanted some. 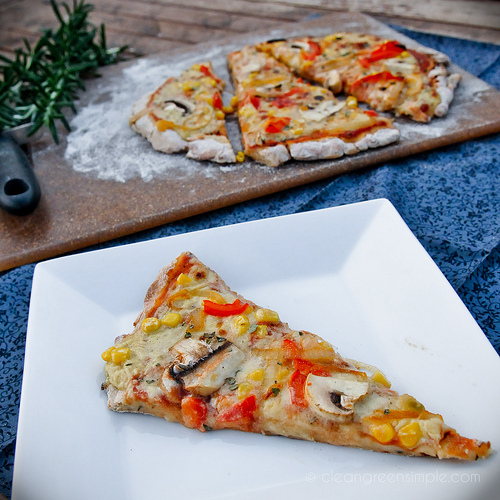 I like shredded cheese on my pizza so I found a recipe for vegan, shreddable, meltable cheese which was easy to make and quite similar to the cheese in this recipe but with a few hours in the freezer was easily shreddable and tasted great. Thanks so much for this recipe. I will make it again and often as I go to many potluck events where vegan, gluten-free, nut-free, soy-free, dairy-free are requirements. This recipe looks super yummy. I plan to try it tonight and will bake it in a traditional oven. My question to you is this: Did you mean to say pre-bake for 60-90 seconds? Is this just if you plan to use a skillet rather than a pizza stone in an oven? 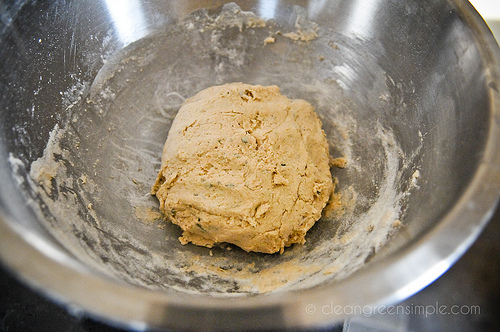 Doesn’t seem like much time to pre-bake dough, especially if you are only planning on cooking it for 4 minutes.